It’s optimized motor design for low-vibration and quiet operation. Use the squirrel cage motors with cylindrical rotor for hoisting duty. Type of protection IP 54 (IP55 is optional) 40%ED, F class insulation with thermal contacts to protect against overheating (60%ED is optional). Motor cooling fan is a all-time running, seperated fan attached behind the motor. 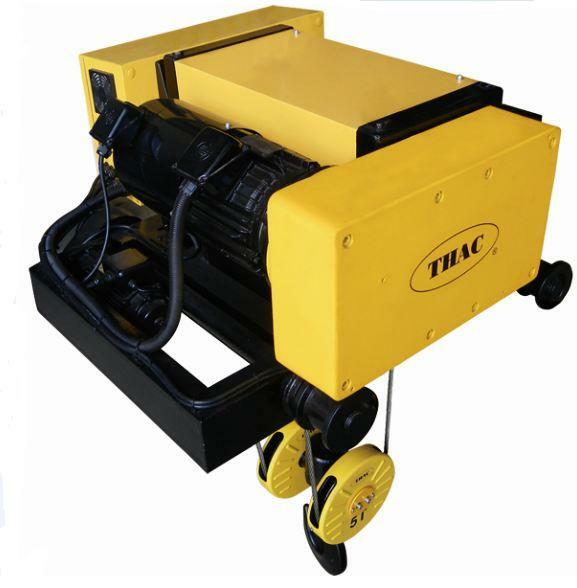 It provides high efficiency of cooling effect on motor even when motor is idle. A 3-stage helical gearbox with high endurance gearing tat the material adopts processed alloy steel SCM415 and the heat treated hardness reaches HRC60 degree, solidity, durability and high precision. The disk electromagnetic brake features automatic braking in the event of a power failure. Asbestos-free lining can reach 1,000,000 times under a normal application. 2nd mechanical brake is optional. Long service and trouble-free mechanical brake provides dual braking system to ensure operational safety. 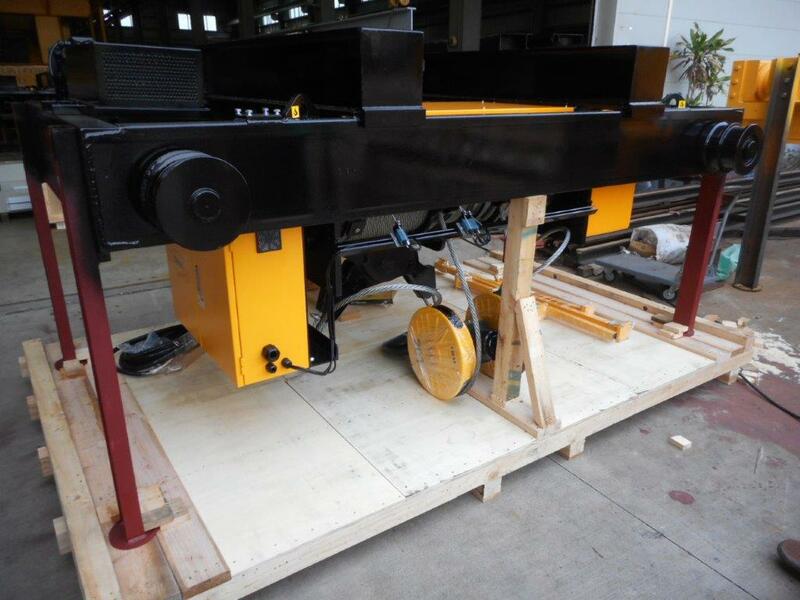 Automatic cuts off the hoisting and traveling motions in upper (two positions), lower, left and right limit positions; prevent mechanical failure from over traveling of the hook. The 360°swiveling hook is made of high strength and high resistance forged steel and is fitted swiveling crossbar. The elegant bottom blocks are equipped with protective edging around the rope opening and are provided with an anti-drop safety latch. The rope is made of high fatigue-strength and wear-proof flexible steel. The minimum use coefficient is according to ISO, JIS, CNS & CNAA#70 standard. ***Standard apply the high strength galvanized steel wire rope. Made of tough metal and plastic, the rope guide lead-in by means of hardened pressure rollers mounted on anti-friction bearing. The rope guide also reduces wear on the rope and rope drum to enhance the safety and durability. The main line On/Off lets you cut off power by pressing a button close at hand rather than the primary power source. The advanced features of water-proof and dust-prevented meet IP65 improve its flexibility and durability. 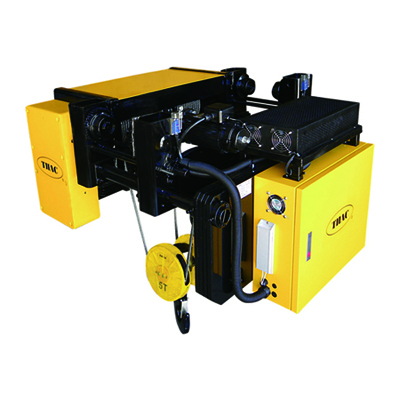 It is useful for controlling the number of hoists in operation. Emergency stop as our standard specification is the added-on safe device for our valued customers. Wire harness is clearly labeled for easy repair and maintenance. Control box have good water-proof, dust-proof and the enclosure meets IP54 specifications. Standard man voltage are 3 phase 380-440V 50/60Hz and standard control voltage is 48V. Other main and control voltage are also available by request. To provide better heat rediation, our inverter resistor is made of steel. 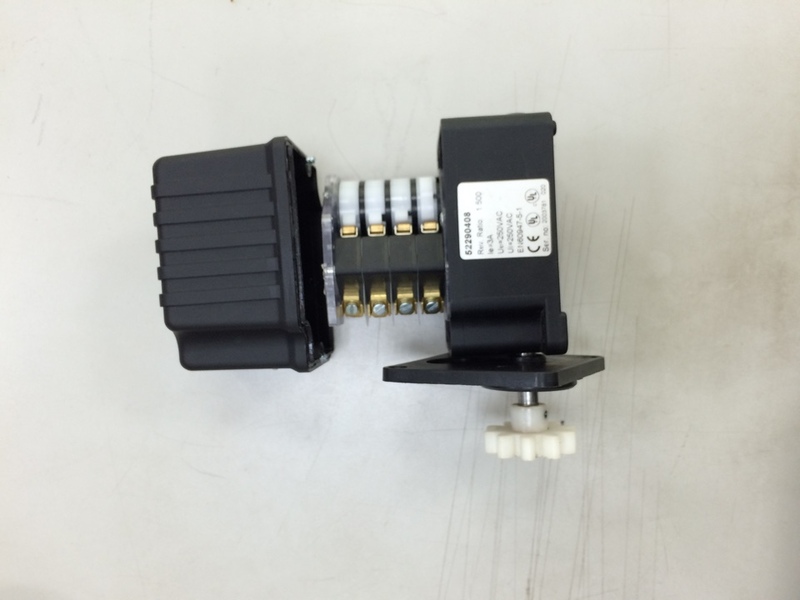 By inverter setting and one limit sensor, our hoisting speed can be 3 steps; low speed, high speed and fastest speed. The fastest speed activates when hook is without loading. Fast and exact positioning enhances the performance in overhead material handling. Reducing power consumption to save energy is also the benefit of frequency inverter application.